Laura McBride’s debut novel captures the times in which we live with a story that skillfully weaves four narrative strands into a compelling and unforgettable tapestry. 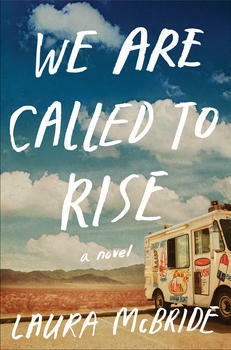 Set in the neighborhoods of Las Vegas, We Are Called to Rise tells the stories of a middle-aged woman whose marriage has suddenly collapsed, an eight-year-old Albanian immigrant boy whose family is struggling culturally and economically, and a recently returned Iraq War vet with a head injury and PTSD. The fourth narrator, who appears occasionally, is a social worker who becomes a Court-Appointed Special Advocate (CASA) for the boy. The first half of the book introduces us to the lives of the main characters in alternating chapters. Avis is forced to cope with her hotel executive husband’s surprising request for a divorce when she should be overjoyed with the return of her son Nate from Iraq. He has completed police academy training and is about to join the Las Vegas Police Department. Nate’s young wife, Lauren, is even more thrilled to have him home. But something about Nate seems off. He’s impatient, prone to angry outbursts, and abusive to Lauren. So while Avis tries to determine where her marriage went wrong and what she should do next, she tries to save Nate and his marriage. Bashkim is a sweet-natured, bright boy who is thriving in school and keeping a watchful eye on his little sister, Tirana. His parents own an ice-cream truck, a seemingly failsafe source of income in the Nevada desert; yet the Ahmeti family is in financial trouble. But his father was a political prisoner in Albania and remains hostile and even paranoid. He has isolated the family from everyone, including the local Albanian immigrants. Bashkim’s mother attempts to hold the family together and serve as a buffer between her husband and the children but bears the brunt of her husband’s discontent. Army Specialist Luis Rodriguez is being treated at Walter Reed Hospital for a head injury and PTSD after two traumatic incidents in Iraq, which have left him wracked with guilt. He hopes to return home to Las Vegas to live with his abuela (grandmother), who raised him, until he can figure out what his options are. The lives of these characters intersect in a moment of violence that is shocking and yet seemingly inevitable. The second half of the book explores the aftermath of an event that has left Bashkim’s future in limbo. The conclusion, while perhaps stretching the boundaries of plausibility somewhat, is emotionally fulfilling. McBride’s ability to fully inhabit each of these characters is an act of supreme authorial empathy. The four narrative voices are distinct, idiosyncratic and, most importantly, instantly credible. You will love some of these people and respect others, but you will care about all of them. They are as real as your friends and neighbors. Another strength of We Are Called to Rise is the pacing. Although alternating narrators can sap the momentum from a novel when not done well, McBride keeps the chapters to a manageable length and never keeps a character offstage for long. As a result, the story moves at a steady, increasingly tense pace. There is a paradoxical sense of foreboding and hope in these pages; one feels the plot strands coming together inexorably, but McBride’s tone and the reader’s inherent optimism combine to maintain a feeling of hopefulness. These characters have such big hearts and good intentions that one roots for them despite knowing that circumstances rarely turn out as one would like; life so often chews up and spits out people that it can seem as if that is its purpose. But when we doubt the presence of God or an overarching purpose, we can find it if we look for the people who are trying to help. Readers will find those helpers in We Are Called to Rise. My only quibble with the book is the overuse of names in dialogue. People simply do not use each other’s names this often when they’re talking. It occasionally detracted from the otherwise believable and mostly natural-sounding dialogue. McBride has used the setting of suburban Las Vegas effectively. A longtime resident, she shows us the real Las Vegas, where working people live, love, go to school, marry, and raise children. Its neighborhoods are both Middle America and sui generis. As a lifelong Californian with two family members who’ve lived in Las Vegas for 15-20 years, I can vouch for the fact that this is as accurate a description of the real place as you will ever read. Roberta, who provides the closest thing to an objective viewpoint, describes how these children go off to war, having been raised in a city with a large military presence. “In Las Vegas, armed forces recruiting centers dot the landscape like Starbucks shops, across from every high school, near every major intersection. Everyone knows someone in the military. Thousands of people live on the base at Nellis; many thousands owe their livelihoods to it. Schoolchildren thrill to the roar of Thunderbird air shows, commuters estimate their chances of making it to work on time when they see four jets return to base in formation each morning. McBride can write up a storm and, like the gods of old, she can throw down one perfectly aimed lightning bolt after another. At one point, Nate attempts to describe to Avis what it was like serving in Iraq. His explanation is the most comprehensive fictional depiction I have yet encountered of what it is like to fight in that complicated conflict and how it feels to come home to a completely clueless civilian population with the war still going on in your head. Ultimately, though, McBride presents us with a vision of a world in which good people step forward and try to make someone’s life better, in which a “new normal” can come out of a tragedy. In which little things matter immensely. We Are Called to Rise will carry you away for a few hours, break your heart, and then put it back together tentatively, the fragile pieces held together by hope and love and the little things that matter.